This enormous fella has staked out a place in the back yard in between our palm and magnolia trees. I did not get out the broom because it’s obvious he’s a bit long in the tooth and is therefore a survivor since anything that lived though this past summer has to have a lot of gumption! (Not to mention I’m also a wimp. If I try to smack him I might miss, and then he might decide to smack me. Or eat me. He’s as big as my hand!) As long as he (or she) stays outside and away from me, we will get along swimmingly. He can eat all the outdoor bugs or rodents that he wants. Arachnophobia is the fear of spiders. 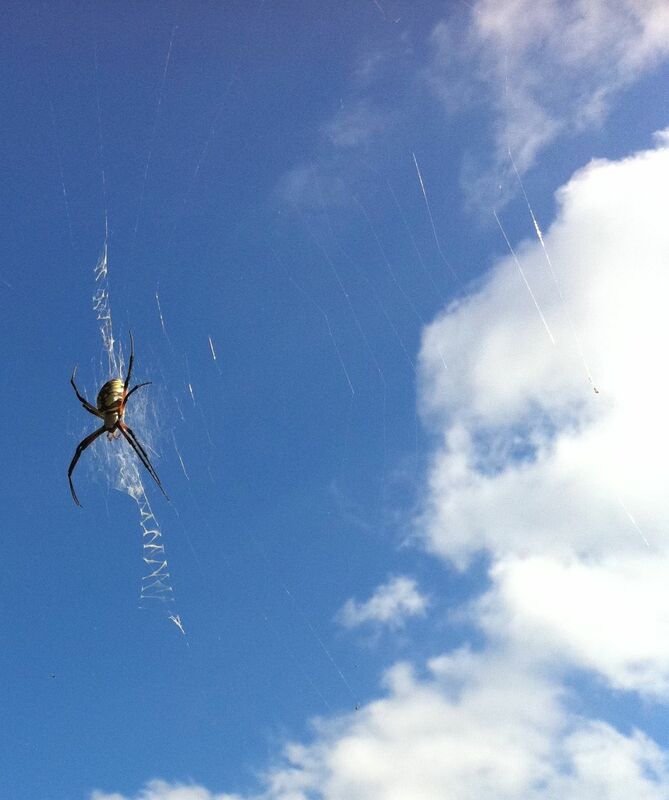 Someone who has that particular fear might pass out if they walked under that spider in my back yard this afternoon! Today I visited my internist for a follow-up and shared with her my fears about my upcoming surgery. I told her that me walking willingly into this surgery, knowing that nausea could be a factor, is like an arachnophobic person willingly snuggling in a bed that is crawling with tarantulas. My doctor wisely gave me a prescription for phenergan, just in case. Okay, I have to admit that sticking my head in a plexiglass cube full of tarantulas would not be my cup of tea, either. But stepping into this hysterectomy two weeks from Wednesday is requiring every bit of self control I have –and some that I don’t have. As I count down the days, I feel more and more trapped like Grant. I’ve even wished for death. I’ve thought, in my deepest, lowest moments, that the only time I will be free of this fear of nausea is when I am no longer breathing. Maybe this means I need to go on an antidepressant…except those drugs all come with warnings that use of antidepressants could lead to suicide! (Not to mention…they could cause nausea…which is my problem in the first place!) Isn’t that like Tylenol causing headaches? I’ve been this low before. When I was pregnant with my second baby (before the miscarriage) I had unrelenting nausea. It did not respond to medication. I went a month without sleeping. I did not eat or drink due to the nausea. I dropped to 78 pounds, and I got a severe bladder infection. I remember curling up in bed with the blinds closed, wishing for death, because death would mean release. I recognize that I am in a dark place right now because I am at my most vulnerable. I know it’s not me wishing for death — it’s Satan whispering those words to me. It’s a spiritual attack, but God has my back. And in just a few short weeks, I will face this fear head on with the Lord himself holding me up and fighting at my side. I keep reminding myself that my own hormones are making me sick. They have gone haywire and have led to severe pain, lesions, scarring and probably internal bleeding. My immune system is out of whack due to all the inflammation in my body. I’ve tried prayer, electro therapy, changing my diet, supplements, hormone testing, and waiting. And I just keep getting worse. On the off chance that I am way off the road God has marked out for me, I’m praying a Gideon-like prayer. I am asking the Lord to close doors at my pre-op appointment this Wednesday if surgery is NOT the right road. If all the doors remain open, then, like Gideon, I will be convinced that NOW is my time to fight whatever spiders…or surgeries…or bouts of nausea…come my way. Oh Christie, how I wish I could help, or at least come by for ice cream and a hug. I can’t imagine how scared you must be! I’ll tell you a little dirty secret so you feel a bit braver…I can’t go to the dentist. Yes, the dentist! Having someone else put their hands in my mouth triggers my gag reflex, so I can’t do it. As a child it was no problem but since I’ve been a grown up, it’s been a problem. Oh, I’ve tried, but nope. Sigh. Hang in there. I’m praying. Next Next post: When is a door a door?